I spent some time last Friday emailing and calling companies that sell Aussie tea towels to see if anyone was interested in donating a few for Aussie Heroes. I emailed two companies, no reply from one and the second said they didn't have any tea towels they could donate at that time but offered me a good deal if I wanted to buy some. We don't have funds to buy things like that but I appreciated the offer. Times are hard. You can't expect everyone to be able to donate. I phoned the third company to get an email address and ended up talking to the co-owner, Kay Rodriquez of "The Tea Towel People". They are Australian designers, printers and manufacturers and if I had my choice they would be the one company I would like to get a yes from. Kay sounded really positive but she asked me to send her an email first. Well, I guess Kay liked what I wrote and what we are doing as today I received a box of tea towels - THIRTY TEA TOWELS!!!! The Tea Towel People make the most beautiful tea towels. You really should get over to their page and check them out! Here are the ones that Kay send us. I love these ones. There is even an ANZAC Biscuit tea towel! And I love these too! These are going to make some awesome quilts - I can't wait to get started but I have quilts and laundry bags to finish off first. Discipline! Hmmph! Oh well, these gorgeous tea towels will be there when I am ready! As you would know if you have left a comment, I always reply to them and I really enjoy them. Yesterday I got a lovely message yesterday from Alison, but unfortunately I can't reply as she is a no reply blogger. I don't mind if you don't mind Alison but if you would like to change from being a no reply blogger then check this out and you will be able to rectify the situation. In the mean time, thank you so much for your kind words, have fun at your quilt retreat and feel free to leave a comment any time you like. Big post coming tomorrow night. I will try and remember everything I want to pass on about posting off the quilts and laundry bags. I will also give you the addresses you need for posting and I will give you a list of things you can include if you have spare room and weight. Two weeks tomorrow till we can start posting. Don't panic though as we can post till the 15th of April. Three new quilts to show you today. These have been made by Diana in QLD. and the colours just really say AUSTRALIA to me! I have been madly binding today and yesterday. More finished quilts in the next few days but some of the ones I have sewn the binding on are waiting for some hand sewing. Your lovely star quilt Sue B is one of those waiting for handstitching. It looks great! 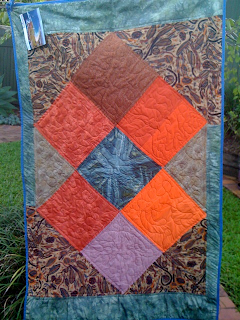 Tarnyia and Sue P your binding have been absolutely perfect for some of the quilts I have been finishing off! You have saved me so much time! I still have another bunch of quilts to bind but I am getting there. I am also getting ready to write the tutorial for the next BOM. Experienced sewers out there please bear in mind that there tutorials are aimed at beginner quilters so that they can contribute. If you want more of a challenge please feel free to do the same as Claire and make a batch of blocks and then turn them into a quilt top. The fabulous Caz is coming over again on Friday to have an Aussie Heroes sewing day. The invitation remains open if there are any other Sydney girls that would like to come and join us. At this stage I haven't decided if we are going to do laundry bags or nine patch quilts. If you are interested in coming just leave a comment or email me. First up if you are planning to sew some of our 9 patch BOMs you need to get a wriggle on to get them done and into the mail as the mailing date is this Wednesday! My sister-in-law, Julie, posted me 10 great blocks which arrived today - these will go nicely with the brown ones I have. Naomi has put 18 blocks in the mail! Today I heard of a lovely lady called Claire who has made 24 and is not sending them to me as she is going to turn them into a quilt top herself! thanks so much Claire - that is awesome! Also, today I received the stickers that I ordered to go on the boxes we send. If you are planning to post direct please send me your address and the number of boxes you think you might send so that I can send you some stickers. I will write a whole post on the boxes and the addresses and all that is required but in the mean time here is a little info. I first started sending boxes to a particular lovely Warrant Officer and his team and I used his personal address. Every soldier has a mailing address. That was not going to work long term though so he and a Major who made contact with me worked together to find the right person to become the point of contact for the long term. I now have the address for the Operation Slipper Chaplain and all our boxes will go to him twice a year to be distributed along with all the other welfare mail that gets sent every year at ANZAC Day and Christmas. Last year they received 22 tonne of care packages over the Christmas period and that they are expecting 25 tonne next year. that is a lot and that is why a mass posting of quilts has to go over at the right time, along with all the rest of the welfare mail, when there are special arrangements made to accommodate and cope with it all. The Chaplains are in the best position to decide where the greatest need is and they can get stuff out to the outposts where the guys are doing it the toughest! That is exactly what we want. The boxes we post in March/April will be the first that have gone under the Aussie Heroes name and I would like them to be easily identifiable so that the chaplains know what they are and also to raise the profile of our group over there. The importance of a bigger profile is so that 1. we continue to be taken seriously by Defence and continue to be welcome to send with the welfare mail but also 2. so that the guys and gals over there learn about what we are doing and are encouraged by the fact that we are supporting them in this way. Hence the stickers. A sticker on the front of the box - top left corner I think - should help the name to stand out. These are the boxes you need - Bx2 is written on the back just under the return address space. You need to put one of these labels on the front - I suggest on the bottom left corner - that way when the postie sticks his ID recorded sticker on it shouldn't cover up the Aussie Hero Sticker. I have updated the "How to Help" page at the top of the blog. Basically if you are time poor but still want to help you could donate any of the following: batting (which you already knew about), calico or other suitable colourfast fabric for lining laundry bags and inkjet printable fabric for labels. The only requirement for the printable fabric is that it must be washable after printed. And lastly - how about this for a bit of encouragement! I will let you read for yourself! My name is Carol xxxxxx and I am the President of a non-profit quilt group in Maryland (US). The name or my group is "Quilts for Heroes" and we would like to send you a quilt to support your efforts. Can you send me information on what you need and where we could send the quilt? Till next time.....keep spreading the word and happy stitching! I have had a couple of requests for tutorials on binding so here we go. For this one I will show you how to sew the binding on to the back first, then fold it over and machine sew it down on the front. I do this because I have arthritis in my hands and although I have friends who will do hand sewing for me there is no way I am going to ask them to hand sew every Aussie Hero quilt that I bind - that would be too much! It is also quicker if you are trying to do a lot of quilts. First I cut my binding 2 3/4 inches wide. Normally, if handsewing, I do it 2 1/2 inches but the extra quarter of an inch makes it easier to turn it on and not have the machine foot sitting on the bulk of the seams. I am assuming everyone knows that we use a double binding, ie the binding folded in half lengthwise and pressed, raw edges sewn on one side of the quilt and then the folded edge turned over and sewn on the other side of the quilt. Cut your strips edge to edge rather than along the length of fabric - there is a reason for this and it has to do with the strength and integrity of the binding long term but I am not going to go into it here. you will just have to trust me or google it. Cut off the selvedges of the strips and then join them together. Normally I would join binding strips on the diagonal (see here for how). That makes the join less bulky on the edge of the quilt but if that is too hard then just join end to end with a straight seam. I have done both for AHQ and noone has complained yet. Fold your strip in half and press. My suggestion is that you store your binding rolled up in whatever you like and keep it rolled up, unrolling a bit as you go. You are much less likely to be plagued by tangles like this! Now to sew your binding on with a scant quarter inch seam - pick a spot roughly in the middle of one side and start sewing the binding to the back of the quilt. Start about 6 inches in from the edge of the binding - this tail will be needed for joining the ends later. Then fold it straight down over the fold ...start sewing again from the top edge and keep going to the next corner. Repeat each time you get to the corner. I hope that is clear - if you are not quite sure then google tutorials on quilt binding and you will even find some youtube tutorials that might help you! Once you get back to nearly where you started keep sewing your binding till you get to about 6 inches from where you started stitching! Lay the two ends over each other and cut them so that there is a scant half inch overlap. Unfold both ends, pin both ends together - right sides together and stitch with a quarter inch seam. Hmmm, maybe I need a hand model! Finger press this seam open. Fold the binding in half again and if you like pin it in place. If your binding doesn't sit flat you have probably allowed a little too much of an overlap or have sewn the two ends together will too narrow a seam. Stitch the seam again, check for fit and if it is okay you can unpick the first seam and finger press again. Now it is time to stitch the binding down on the right side. This is when you mitre the corners and I think a picture tells the story. Fold over one side first, then fold the other side down. I like to fold the right hand side down first and then the left hand side as this means that when I start to machine I am sewing over the little fold and am not likely to get the sewing maching foot caught in it if that makes sense. I pin my binding all the way round (my least favourite part of the whole process) and then stitch as close the edge as you are comfortable doing. I like a straight stitch but you can use a zig zag and you can also use a fancy stitch if you have them. Keep your eyes on other people's blogs and you will see what they do. No idea why this pic is so dark! Can I just take a minute to say how much I love this binding and how well it goes with the quilt backing and I think the quilt top as well. The top, the backing and the binding were all donated and not by the same people! Just meant to be! And here is the resulting quilt made by Maria - her lucky number 7th! The photo does not do the colours justice - suffice to say that I am not a brown loving person but this quilt has converted me and I think this would be great for a guy or a girl. I hope this has answered all your questions - assuming you had some. If not email me or leave a comment and I will do my best to answer them! Couldn't sleep this morning so I decided I might as well get out of bed and do something useful! I managed to get the binding onto two quilts! Happy with that! I also managed to take pictures along the way to put into a binding tutorial that I have been asked for - more on that tomorrow. This is the latest quilt I have bound - this one was made by Maria - her 6th quilt! I had a lovely email last night letting me know that another Sydney based quilt group is probably going to have an Aussie Heroes sewing day - happy dance here! I won't say any more till I get confirmation but I have asked them to let me know when and maybe I will be able to go along and take some pictures to share with you. If anyone else is planning a sewing day I would love it if you could send me a picture or two so that I can post it on the blog and share it with everyone else! Also if you are following this blog regularly and haven't clicked on the Follow Me button it would be great if you could. I regularly write to companies to ask for sponsorship and the more visible followers shown on the blog the more they are inclined to jump on board. That is just under three weeks till we can start posting! I am excited - how about you! This is the latest quilt ready to go and it was made by Maria - this will be her fifth quilt and there are three more on the way!!! I just love these little trains! Too cute! I have just ordered some Aussie Hero stickers to put on the boxes when they are sent so that the Chaplains can more easily identify them as coming from us. I would like to get send a few to everyone who is planning on sending a quilt or a laundry bag so that you can put them on your boxes. If you are planning to send something could you please email me with your address and the number of boxes you think you will be sending and I will put some stickers in the mail to you. Some great news is that my lovely local quilt shop - Country Pickin's at the Corner - will soon be displaying an Aussie Hero Quilt and will be encouraging people to get involved! This is such a generous store - they have always been supportive of my quilt group and now they are terrific with Aussie Heroes. If you are in Sydney you should check them out - they are the best. They are holding a Quilt Retreat on the last weekend of July. It will be in Katoomba and let me tell you - I went last year (check it out) and I had a blast - anyone want to join me this year? But back to my original point - it is pretty good of them to display and AHQ quilt. I am pretty excited about that. Till next time........keep spreading the word and happy stitching! of a quilt being quilted! This was my view for most of today - that is when I wasn't layering quilts! Cynthia, Andrea and Del came over today and we got busy really quickly. We had ten quilts to layer - DONE! Ten quilts to quilt - DONE!!! YAY!!! These seven quilts are trimmed and waiting to be bound - I hate the trimming! Luckily Cynthia did these! This ten has been quilted and they are waiting to trimmed and bound. And this quilt is finished - bound and all! We also had time to look at the BOMs that have been coming in. There is another week to go before your BOMs need to be in the mail. I can't believe how many I have received. These came from Sue! I am going to team these with squares and a border. I think it will make a great masculine quilt. These came from lots of people, including Andrea who came to help out today. Andrea arranged these and I think this is going to be a great cheery quilt. No sashing, just a border. And these are what we have left. We decided that this just needs a few more to be big enough, again without sashing I think. my sister in law just emailed me to say that she has put ten nine patches in the mail today so they are going to fill this out nicely. They are blue and cream apparently so I think the blue and the brown will go together nicely! Can't wait to see them! Who knows, maybe there are more in the mail too! What was in the mail today was this lovely parcel from Rachael Davies from www.gidgishop.com/. I noticed that she had some really cool Aussie Animal Tea towels in her shop which I thought would be wonderful in the centre of some Aussie Hero quilts. I sent her an email and asked if she would be kind enough to donate one or two for the cause. I received a lovely email back saying she would like to send one of each design and keep up the fantastic work supporting the soldiers. Nice huh! And are these styling or what! For you overseas readers the animals are L-R starting with the back row- Tasmanian Devil, Wombat and Emu, and front row, the long extinct Tasmanian Tiger and an Echidna. I think I am going to hang on to these and make these quilts myself! I don't normally cover anything in Aussie Heroes other than things to do with the project but, as the soldiers we are sewing for are currently serving in Afghanistan, I thought I would this time. I have just finished reading a fascinating and inspirational book about a woman who managed to support her family and her community in Kabul, Afghanistan, by learning a craft and starting a small home business that grew and flourished in almost impossible circumstances. It is called "The Dressmaker of Khair Khana" and if you want to know more about it you can check it out here - I don't want to duplicate too much of what I say on Cherry Red at the risk of boring you. Remember - one week to go till you need to post your BOMs. Three weeks tomorrow till you can start posting your quilts and laundry bags off to the free address - Remember parcels need to be less than 2KG! Cynthia and I had a big day today. We hid ourselves away in the back room at my home which is supposed to be the boys' hang out room, except they never use it, and which is where the Gumnuts and Aussie Hero donations are stored. My hubby was kind enough to set up two folding tables for us on the weekend so we had lots of room to work. This is the shelving unit that I use to store all my scraps as well as those that have been donated to the Gumnuts. I am going to say that of course I wouldn't need a unit anywhere near so big if I didn't have the donated scraps as well............of course I wouldn't..........really. Oh well, let's move on. You will see a better shot of it in the next picture. The most important things to notice in this picture are the new tidy piles of fabric. We spent the whole day sorting through fabrics - some were cut into backing lengths, some were put aside as big enough for a backing if something is added to it, some were put aside for laundry bags and smaller bits were cut into 6 1/2 inch strips. We didn't get it all done but we made good headway. Now when we have a quilt that needs a top we can just go to the pile of 40 or so backings and choose the most suitable. You can also see the lengths of donated Nutex Fabric neatly rolled and ready to be cut. Interesting blog fact - would you believe that this little blog with its 51 followers is being read by people in ten countries! Australia of course and America is not surprising but just today visitors from Germany, Russia, Belgium, the United Arab Emirates, Canada, Slovenia, Austria and Brazil! I think that is kind of nice considering this blog is all about doing something to say thank you to our Aussie soldiers. I guess the notion of saying thank you to those who serve us is one that resonates around the world! You have got to be happy with that! And to our international visitors...welcome and thank you for visiting - hope you will come back! Today's mail - some in and some out. These four laundry bags are on their way to Afghanistan as we speak. Cynthia's son has just gone over there are these are for four of his friends. Cynthia has already sent 18 laundry bags to her son's entire group! We are planning to do quilts for them as soon as the first mail out is done! So, that was the mail out and this is the mail in. This first lot is from Pauline. First her 9 patch blocks - lovely and bright and just what we need. Then two fabulous quilts. Love the use of solids down the sides. The narrow black border really sets this one off beautifully. And I just love black with brights! And finally two laundry bags, also from Pauline. She has done well! And then Maria sent these two laundry bags. Love those bright fabrics, particularly the hot air balloons. Thanks so much Maria and Pauline! if my calculations are correct only 24 sleeps till our first official mailing period begins on the 15th of March. Woo Hoo!!! 50 Followers!!! How cool is that! Word is spreading and more people are coming onboard. We have fifty followers on the blog and a whole lot of other followers on facebook. Cool Bananas!!!! Another completed quilt. This one was donated by Caz. Loving those tea towels. I started out my day yesterday with binding some of the quilts that we quilted and layered last week. Before long look what happened. Both ends of my binding got tangled together! Aggh! A little bit of patience was needed to recover the situation! Hmph! I managed to get this quilt completely bound - thanks to some help from Cynthia who just happened to drop in and did some pinning while I kept sewing. 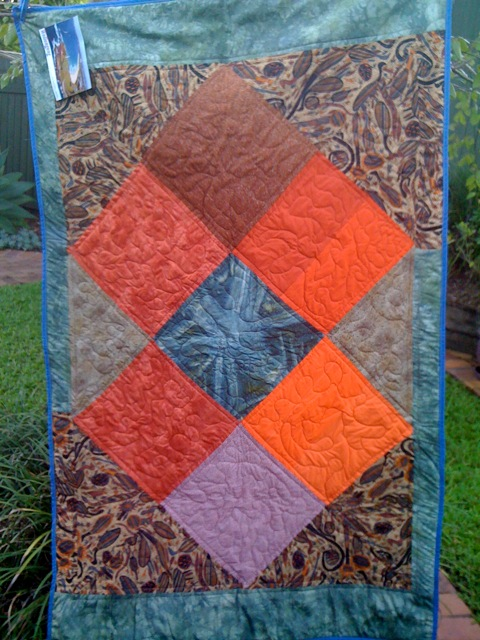 This is another of Caz's quilts! And this is why Cynthia dropped over. She had written to Nutex who manufacture some fabulous Aussie Fabrics - in New Zealand! - and asked for a contribution in the form of the two fabrics that we use for most of our labels. And this is the result of their generosity! 10m of each! That is going to make a lot of distinctive labels! What a generous gesture from them to send it to us all the way from NZ. Today I was determined to tidy up after all the parcels that I have received this week and I managed to get it done but the parcels kept coming and no, I AM NOT COMPLAINING! I love getting mail! and AUSSIE HERO mail is wonderful mail. I got a huge parcel today from Cathy who you can also find here. 11m of this fabulous patchwork fabric for backings - enough for 6 quilts! and this really cool scrap quilt! 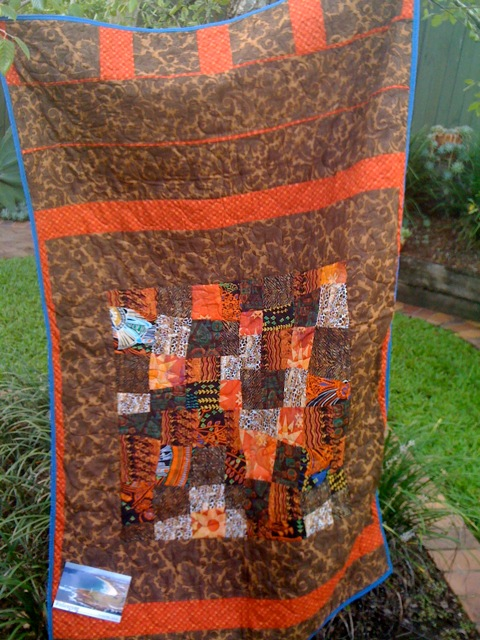 I have to say that I really love scrap quilts! Then I received a lovely little parcel from an American quilter called Lisa from The Red Headed Mermaid. You have to check out her blog. Lisa does some fabulous work - most of it really bright and very eye catching! I love it. I really connected with her when she posted pics of her new home town in Connecticut which just happens to have been my old home town when I lived in the States back when my 15 year olds were 4! Small world. I recognised the places she photographed and I was so excited. Lisa sent four nine patch blocks for our BOM!!! and they are her trade mark lovely colours! Thanks Lisa! each containing another three of these! Queen sized battings! 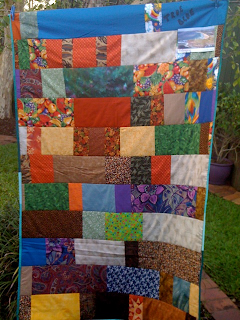 That makes 12 of these that Karen has sent all up and that is enough batting for 36 - yep, that is THIRTY SIX - quilts! Thanks so much Karen. That is like 36 great big hugs for 36 fabulous (and maybe even hunky) soldiers!!! I can't believe another week has passed. By the end of next week I hope to have finished binding all the 14 quilts that Del Cynthia and I layered and Caz and I quilted. Some I am leaving for Del to hand sew for me and the rest I am machining. Lots of things are planned for next week - but you will have to keep reading the blog to see what we get up to!!! So, stay tuned! Till next time....keep spreading the word and happy stitching! 14 quilts waiting to be quilted? Updated version of how you can help.